Strong south westerly winds over the Alps, a front moves through from west to east. Clouds will increase with widespread showers and possible thunderstorms during the day. Weather improvement in the evening from the west. Maximum values between 13° and 18°. The Alpe di Siusi is Europe's largest high alp and a landmark of South Tyrol. At an altitude of 1,680 m to 2,350 m above sea level, the Alpe di Siusi offers exceptional nature experiences at any time of the year with dream views of the Sciliar, Sassolungo and Sasso Piatto, Catinaccio group and Latemar group. In summer, the resort is particularly popular with hiking and mountain biking enthusiasts. A variety of hiking tours and cycling trails can be found in and around the sunny plateau, which is easy to reach with the panoramic cable car or by shuttle bus (bus stop next to the campsite), as well as by foot or bicycle. In winter, Alpe di Siusi / Seiser Alm is a paradise for Alpine skiing, cross-country skiing, winter hiking and tobogganing. The family ski resort offers a choice of easy pistes, a snow park, toboggan runs and panoramic cross-country ski pistes. 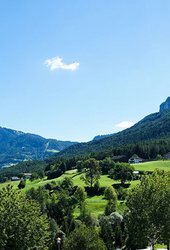 Camping Alpe di Siusi / Seiser Alm is located at only 2,5 km from the valley station of the panoramic cable car. Every 30 minutes, buses stop right opposite our ski-depot at the campsite.